May 30th, 2008: Sunny and warm, Water Temp 74*and Clear. Picked the guys up at 5:30 this morning and set up on main lake 20 to 25 foot flats . 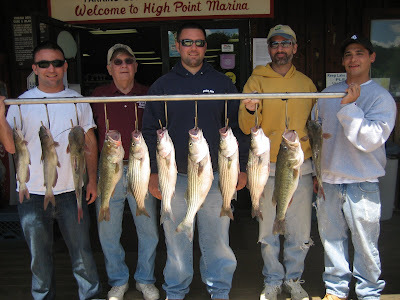 We put out 8 planner boards and a bobber rigged with Gizzards and 7 downlines rigged with Herring and Gizz. Had 4 other friends out in their boats also today so I had a good feel for what the fish were doing, which wasn't much. 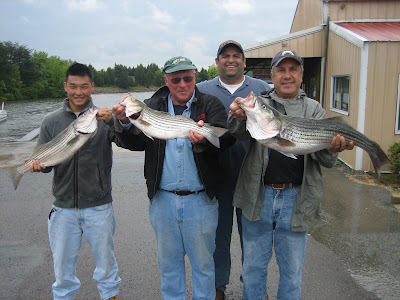 This May has been the poorest May for Striper fishing that I can remember. 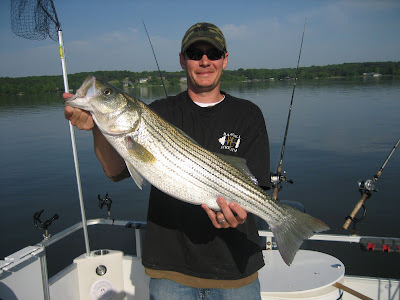 I look forward to June, the downline bite and catching 20 to 50 fish a morning. 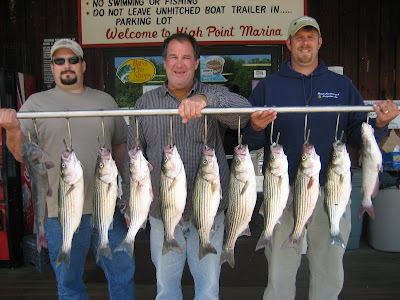 We worked our spread for 9 hours today and caught 6 Stripers and a Walleye. 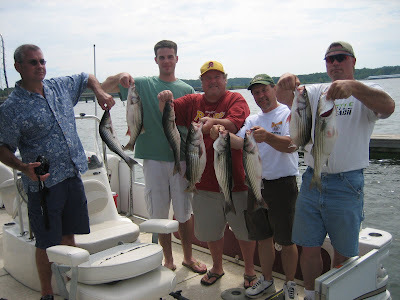 Wendle is pictured with the Walleye, Ted and Mark holding the Stripers. 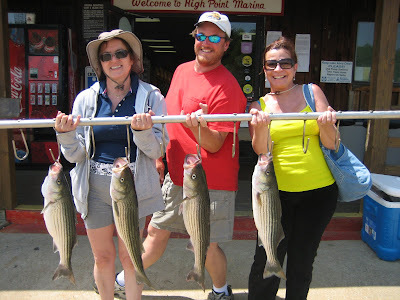 We caught fish equally on boards and downlines today. 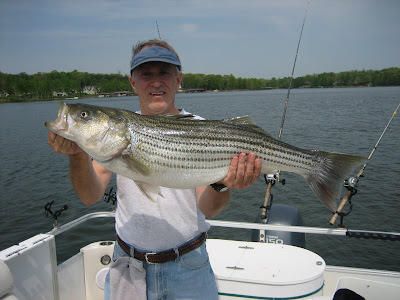 May 24th, 2008 : Sunny and Pleasant, Memorial Weekend, Water Temp 69* and Clear. Caught bait early and picked the guys up at the dock at 5:30 am. Set up on a point nearby with some fish on it but the fish did not want to eat. 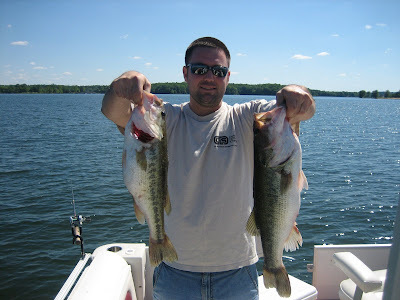 Found some other fish on a main lake flat and put downlines in their faces and the madness began. Fish really weren't eating today but more killing the baits. 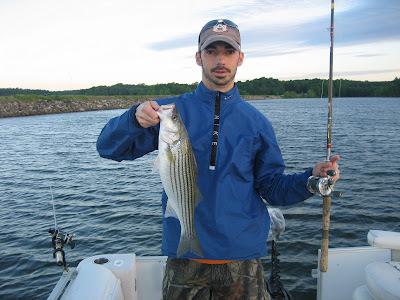 We hit 4 or 5 different places and by 11:30 we had witnessed about 200 strikes, catching a dozen Stripers, a bunch of Catfish and a couple of Bass. 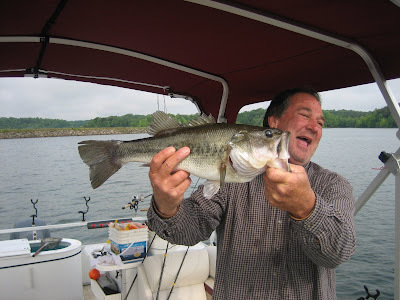 Don is pictured holding 2 of the largest Bass he has ever caught. May 15th, 2008 : Sunny and Pleasant, Water Temp 69* and Very Stained. Caught bait this morning and started off on a main lake flat pulling boards. 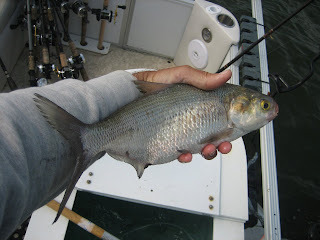 Saw a lot of fish but after an hour only had 2 fish in the boat so we made a move. 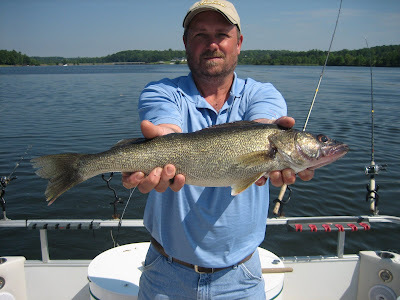 The rain over the last week has really muddied up the lake and I saw plenty of fish in the upper water column. 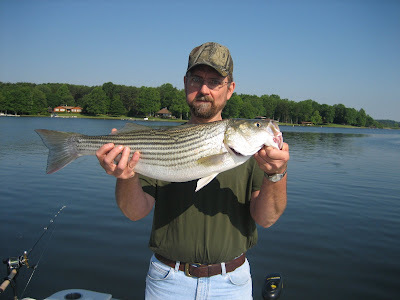 I decided to run up lake and put the biggest baits I had out on the banks and the move paid off, catching 10 Stripers by noon. 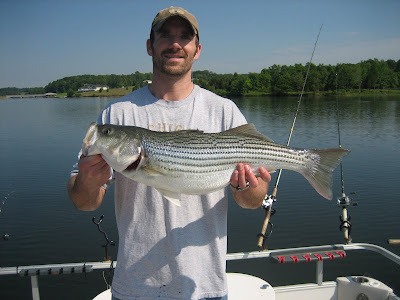 Brian is holding a 10 pounder. May 3rd, 2008: Sunny and windy, Water temp 71* and Clear. 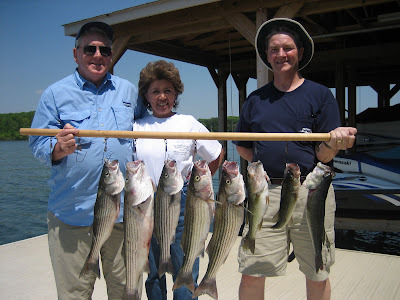 Gary's wife Susan surpised him with a fishing trip for his birthday. HAPPY BIRTHDAY GARY. Picked the guys up at 5:30, went and caught bait and setup on a 15 foot flat pulling boards . 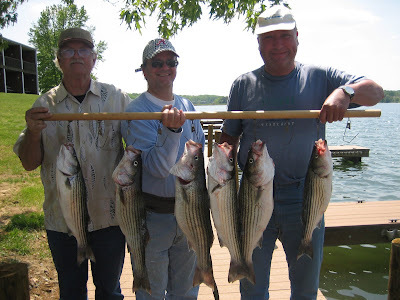 I also had 4 other friends out this morning fishing doing the same. 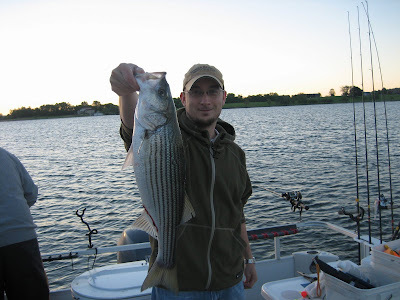 After 1 hour of fishing and having a dozen swirls on our baits with no hook-ups and the other guys having similar action I converted to downlines and started catching fish. 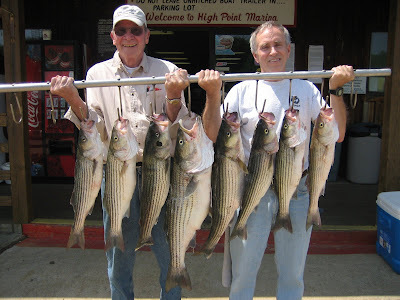 the wind , barometer and boat traffic put the fish down. 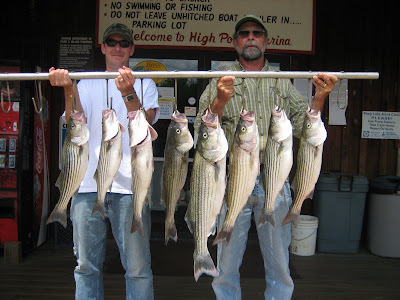 We worked 3 or 4 areas today and caught 15 Stripers and a few Catfish. 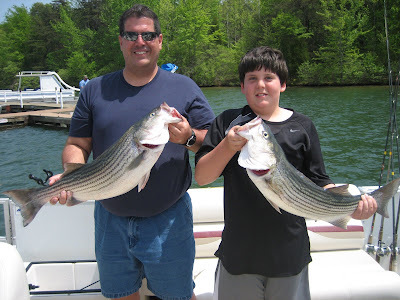 Gary and his son are pictured holding 2 of the better fish, a 10 1/2 and 9 pound Striper. May 2nd, 2008 : Sunny and Warm, Water Temp 69*. 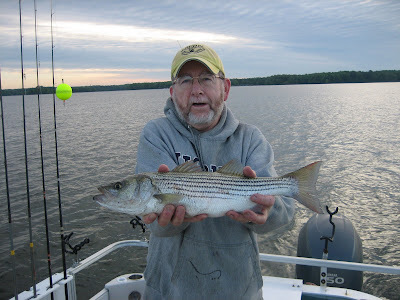 John went out early and caught bait then picked his clients up at 6 am. He pulled the mouths of creeks, points and humps today with boards. 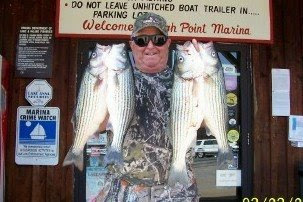 His clients had 20 strikes today, catching 10 Stripers and keeping 4 . Good Job Guys.